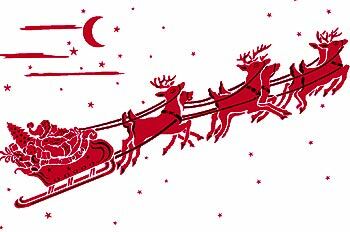 The Large Sleigh & Reindeer Stencil will bring some of the charm and magic of Christmas time to your decorations. 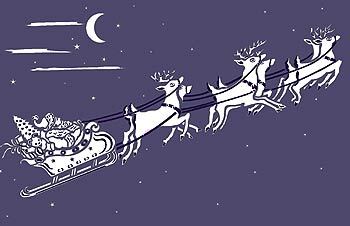 The stencil depicts Santa and his flying sleigh and reindeer out on his Christmas Eve missions! 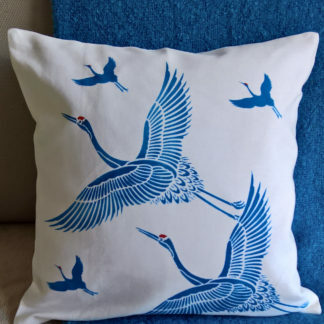 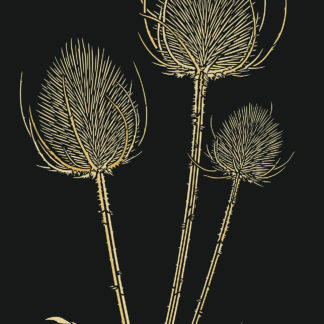 This design works superbly in pastel or metallic colours on dark backgrounds, as well as in more traditional festive colours. 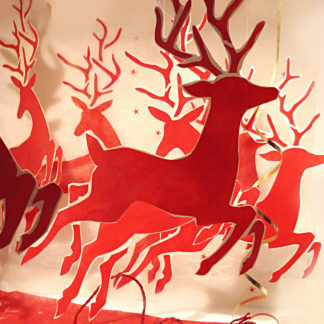 Or try a frosting effect on glass door panels, windows or mirrors, or simply decorate large sheets of paper for stylish wrapping or stencil a border onto festive fabrics and table covers. 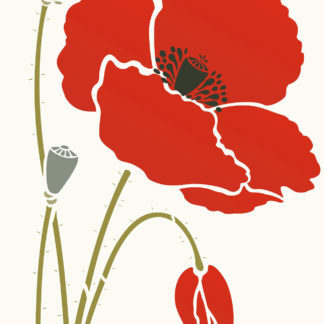 2 sheet, 2 layer stencil – see size and layout specifications below. 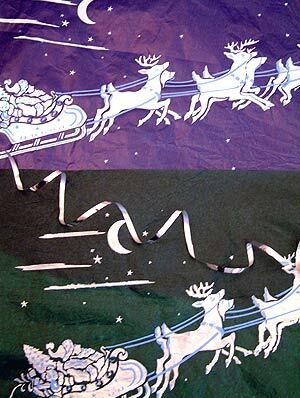 Above top and below – the Large Sleigh and Reindeer Stencilled in midnight colours Ice White, Shoreline and Jet Black Stencil Paints on a dark sky background. 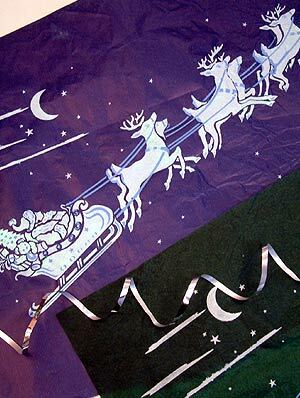 Above and below – the Large Sleigh and Reindeer stencilled in Ice White Stencil Paint and Silver Lights Metallic Stencil Paint with Glitter Paint highlights on indigo wrapping paper. 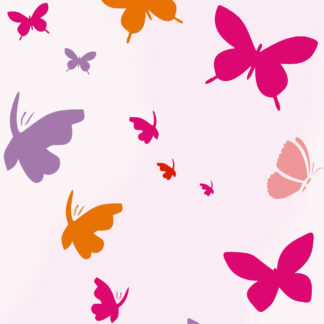 Why not try the Motif range of Glitter Stencil Paints and Metallic Stencil Paints to add extra sparkle and lustre to your creations! 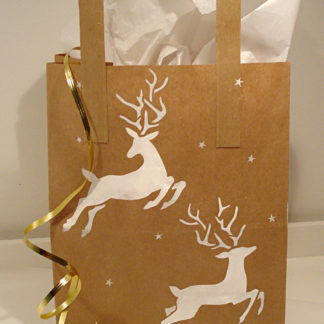 See also our Small Sleigh and Reindeer Stencil. 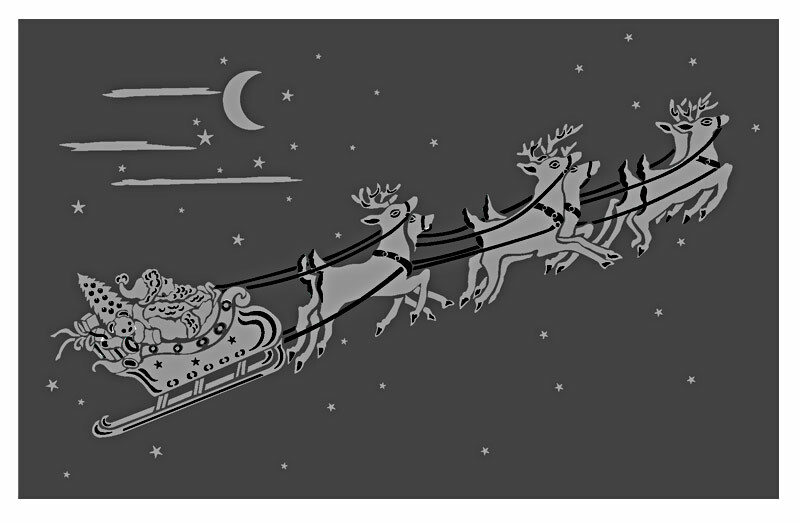 Above – the Large Sleigh and Reindeer Stencil in Very Berry and Navy Charcoal Stencil Paints. 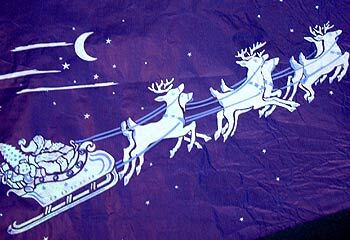 highlights on indigo wrapping paper. Above – close up section od the Large Sleigh and Reindeer Stencil in Atlantic Blue and Navy Charcoal Stencil Paints. 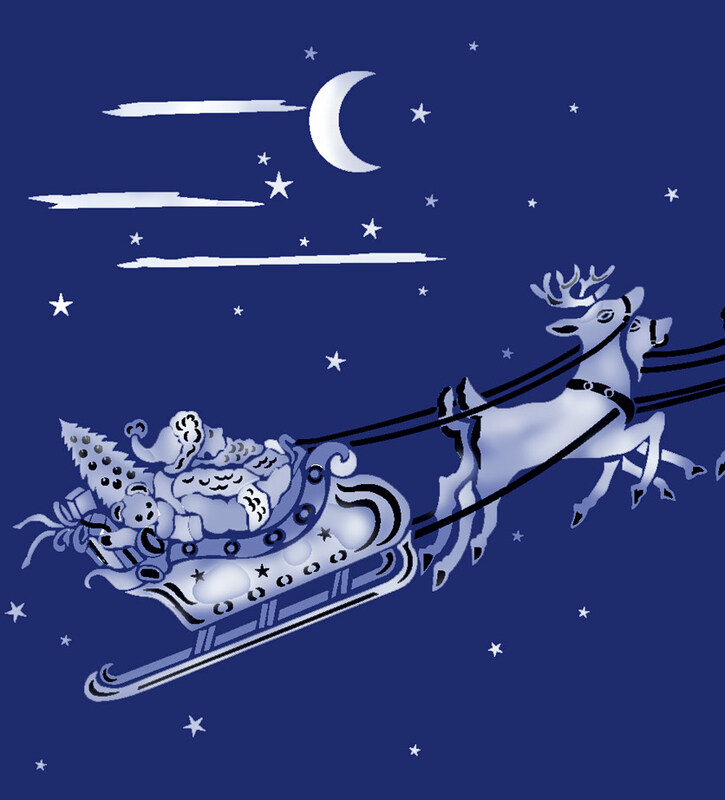 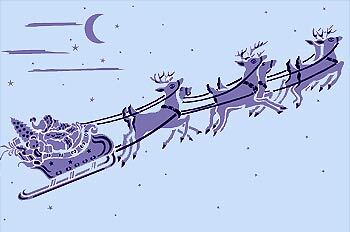 Above – the Large Sleigh and Reindeer Stencil in French Lavender and Navy Charcoal Stencil Paints on a pale blue background. 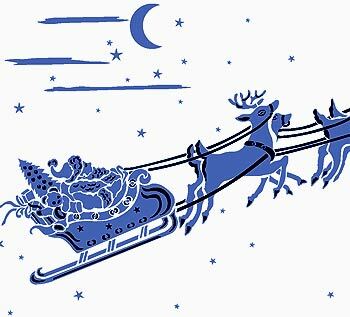 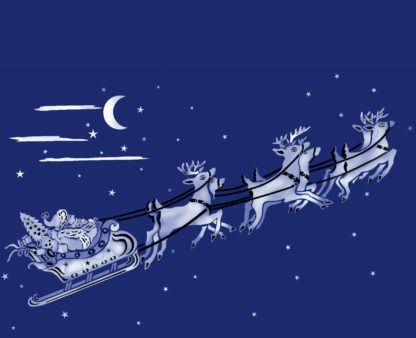 Above – the Large Sleigh and Reindeer stencilled in Ice White and Jet Black Stencil Paints on a soft indigo background. 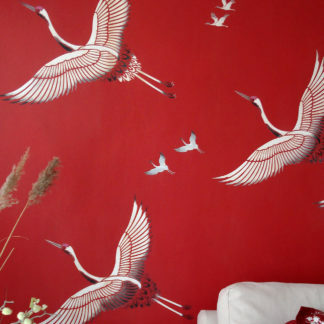 Easy to use two layer two sheet stencil measuring 42cm (16 1/2″) wide by 28cm (11″) deep at furthest points.